Daily Illuminator: What Have We Unleashed In This Month's Pyramid?! August 14, 2015: What Have We Unleashed In This Month's Pyramid?! Temptation lurks in noisome labs, at moonlit crossroads, or amid torchlit catacombs. A descent into darkness can begin with the best of ideas or the most innocent of items. 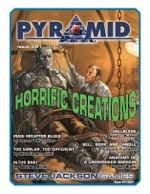 This month's Pyramid magazine looks at all aspects of Things Humanity Was Not Meant To Make, with Pyramid #3/81: Horrific Creations. This issue features a GURPS Horror: The Madness Dossier adventure written by Assistant GURPS Line Editor Jason "PK" Levine. Can you uncover the fate of teammates who have encountered some of the worst fiends in creation? You'll also find a tempting sword that serves as a prison for the souls it entraps, as envisioned by David L. Pulver; an in-depth examination of human hybrids (complete with GURPS ideas and samples templates); and a guide to roleplaying selling your soul for power and profit . . . including what loopholes you might utilize to get it back. Plus, discover three items that allow communication with the those beyond the grave -- each with their own drawbacks -- and an unnatural means of bringing someone back from the dead. Whether you're building a fantasy dungeon, running a modern-day horrific campaign, or designing an evil laboratory of any era, this Pyramid is sure to give you something that makes you shudder. Download from our digital domain individually, or subscribe to Pyramid today and get it and more months of the latest creations for GURPS!